WWE Superstars and Divas get in the Fastlane on the road to WrestleMania! Featuring an amazing Triple Threat between WWE Champion The New Daniel Bryan taking on Kevin Owens and Mustafa Ali. 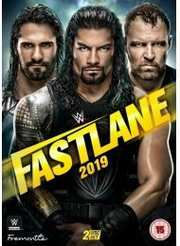 All three tag belts are on the line with The Usos defending their Smackdown titles against The Miz and Shane McMahon, The Revival defending their Raw titles in a Triple Threat against Bobby Roode and Chad Gable and Ricochet and Aleister Black and Bayley and Sasha Banks defending their newly won Women's titles against Nia Jax and Tamina. Will The Man Becky Lynch regain her rightful place in the Women's Championship match against Ronda Rousey as she looks to dethrone the Queen Charlotte Flair. All this, plus extra matches from Raw and Smackdown. Who will come out on top and be declared the winner on the last stop before WrestleMania? Kofi’s Going to Fastlane…Or Is He?